Taste test: These are outstanding sour cream and onion chips, there's a great balance between the flavoring and the style of the chip (not too greasy or overly salty). 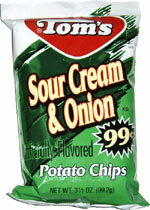 If you like SC&O chips, you can't go wrong with a bag of these. Smell test: No great aroma to speak of here.